Coordinator: Mondal Md. 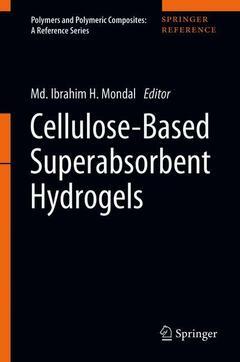 Ibrahim H.
With the prospect of revolutionizing specific technologies, this book highlights the most exciting and impactful current research in the fields of cellulose-based superabsorbent hydrogels with their smart applications. The book assembles the newest synthetic routes, characterization methods, and applications in the emergent area. Leading experts in the field have contributed chapters representative of their most recent research results, shedding light on the enormous potential of this field and thoroughly presenting cellulose-based hydrogel functioning materials. The book is intended for the polymer chemists, academic and industrial scientists and engineers, pharmaceutical and biomedical scientists and agricultural engineers engaged in research and development on absorbency, absorbent products and superabsorbent hydrogels. It can also be supportive for undergraduate and graduate students. Cellulose, superabsorbent and hydrogels.- Cellulose and cellulose structure.- Modification of cellulose.- Absorbents and superabsorbents.- Gels, hydrogels and others.- Hydrogels and its applications.- Synthetic hydrogels and its impact on environment.- Composite hydrogels.- Biodegradable hydrogels.- Superabsorbent hydrogels.- Stimuli-Sensitive hydrogels.- Cellulose-based hydrogels.- Superabsorbent hydrogels – Synthesis and applications.- Stimuli-responsive cellulose based hydrogels.- Structure-property relationships in hydrogels.- Synthesis and characteristics of cellulose-based smart superabsorbent hydrogels.- Applications of cellulose-based hydrogels.- Cellulose-based hydrogels – Smart applications.- Absorption behavior and swelling mechanism of cellulose-based hydrogels.- Cellulose-based hydrogels for personal care products.- Cellulose-based hydrogels for drug delivery systems.- Cellulose-based hydrogels for wound healing.- Cellulose-based hydrogels and tissue engineering.- Cellulose-based hydrogel for industrial applications.- Cellulose-based hydrogels for biomedical applications.- Cellulose-based hydrogels for medical applications.- Cellulose-based hydrogels for pharmaceutical applications.- Cellulose-based hydrogels for agricultures.- Cellulose-based hydrogels for water treatments.- Cellulose-based hydrogels films for food packaging.- Cellulose-based hydrogels: Present and future.- Other natural/biocompatible hydrogels.- Alginate-based hydrogels.- Polysaccharide-based hydrogels.- Chitosan-based hydrogels.- Enzyme responsive hydogels.- Other carbohydrate-based hydrogels.- Protein-based hydrogels.- Gelatine-based hydrogels. Dr. Md. Ibrahim H. Mondal is a Professor in the Department of Applied Chemistry and Chemical Engineering at the University of Rajshahi, Bangladesh. He obtained his MSc degree in Applied Chemistry and Chemical Technology from the University of Rajshahi, Bangladesh in 1986 and his PhD degree from Tokyo Metropolitan University, Japan in 1997. Dr. Mondal was a Commonwealth Visiting Scholar at the University of Manchester Institute of Science and Technology (UMIST) in the UK during 2003-04, Visiting Professor at the Hokkaido University in Japan during 2006-07, and a Visiting Scientist at the Universiti Sains Malaysia, Malaysia during 2009-10. His research area includes natural polymers, cellulose and cellulose derivatives, textiles, and textile wet-processing. He is an author, co-author, or editor of more than 140 research articles, book chapters and seven books.